Fans of oysters in Chelsea, NoMad and Flatiron rejoice! L & W Oyster Company has opened in NoMad New York. This fish shack will be a welcome addition to the neighborhood! You can’t go wrong with clams and oysters. L & W Oyster Company is the brainchild of Jason Weiner, Eric Lemonides and Antonio Rappazzo. Weiner and Lemonides come from Flatiron’s Almond restaurant. Chef David Belknap (formerly of Per Se) is the chef de cuisine. 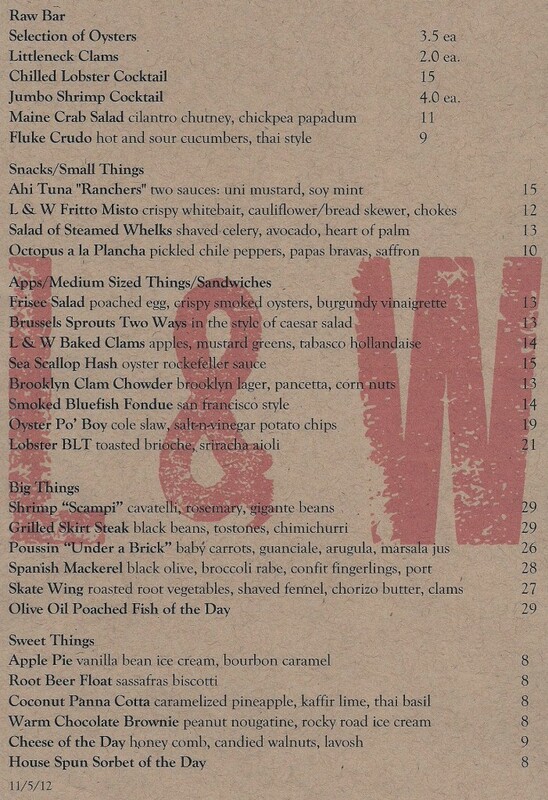 L & W have a pretty diverse menu extending way beyond oysters. They even have steak, brussel sprouts, chowder and sandwiches. This is a great option for a lunch at work or to grab some oysters if you’re in the neighborhood to see Buckyball in Madison Square Park. Tweet us @ExperienceNoMad when you try them out! L & W Oyster Company is located at 254 5th Ave (between 28th and 29th St).